Just as well-known as Black Hills ammunition, the Sierra Match King bullet is an industry leader with regards to accuracy and terminal effects. Black Hills ammo has been making its mark since early 1981 and has been holding itself to the highest level of quality since their humble beginnings. 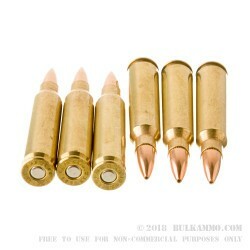 Black Hills ammo chose to pair their brand new match quality high polished non-corrosive Boxer primed brass cases with the famous hollow point heavy weight hard hitting 77 grain Sierra Match King .223 bullet to produce an AR15 round that has all the accuracy of a match grade designated marksman rifle, with the reliability of an AK47. The Black Hills 77 grain Sierra Match King .223 Remington round has a screaming muzzle velocity of 2750 feet per second, and a heavy duty terminal muzzle energy of 1259 foot pounds. Black Hills ammo’s 77 grain Sierra Match King rounds come ready to hit the range in boxes of 50 rounds at a value too good to pass up. 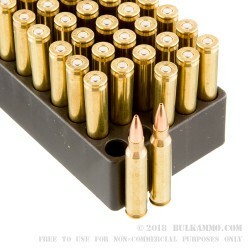 Get yourself multiple boxes of Black Hills 77 grain .223 ammo now before they sell out.